Before making this Graduation Card with Flowers I did a quick image search to see other handmade graduation cards. I was surprised how few had flowers. The recipient is the daughter of one of my cousins, so I wanted the card to be youthful and pretty. 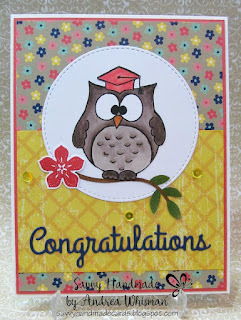 Of course there had to be some element of graduation, so I used the cute graduation owl by Gerda Steiner Designs. The owl was colored with Copic markers, fussy cut and then adhered to the white stitched circle die cut. A little punched branch and stamped flower add some detail along with the congratulations die cut by Impression Obsession and three sequins for sparkle. The floral paper is retired by Stampin' Up! and the yellow is by Recollections. That's it! Thanks for stopping by and enjoy the rest of your day! Beautiful card. Thank you for joining us at TioT. A brilliant graduation card, perfect for a young lady. Thank you so much for sharing with us at Alphabet Challenge. 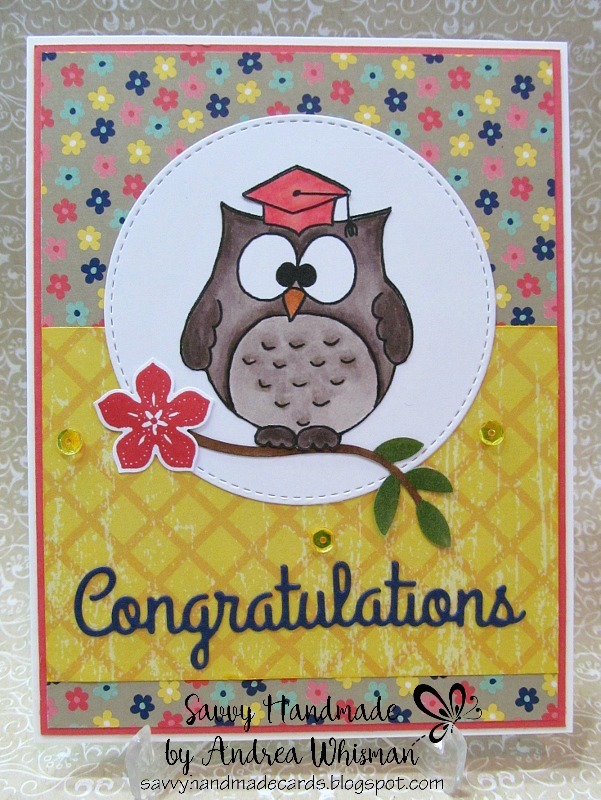 Its a wonderful Graduation card, and a real sweet owl. Thank you for sharing it with us at try it on Tuesdays.